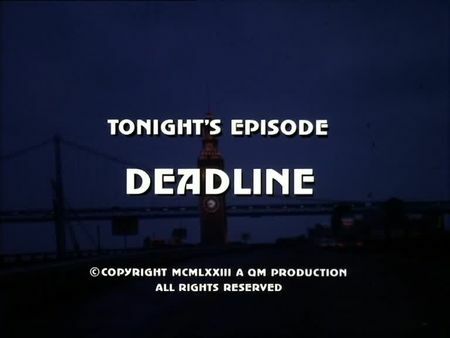 I have just added the screencaps for Deadline to the episodes' page. This case is getting personal for Mike Stone: an old friend and top-notch reporter, Chris Bane, is challenging the homicide detective in finding the murderer of his love affair, young and attractive reporter Maggie Ames, who was found dead in the San Francisco bay, close to Belvedere. Mike and Steve are facing a difficult and confusing investigation as Bane seems to be ahead all the time. We as the audience know that Bane himself, unintentionally, is responsible for the death of his love affair when her head struck a rock in a dispute with her jealous lover. Bane, a brilliant investigator according to Mike, skilfully creates indications and tries to lead his old friend and Steve on the trail of another lover who saw her last: a young actor using a pseudonym - who turns out to be Bane's son. There are not too many different filming locations for this episode, actually. We are frequently taken to Belvedere, just north of the Golden Gate Bridge, as well as to the Coroner's Office, and the American Conservatory Theater on Geary. The blackmailer who had witnessed the murder was killed in a small back road of unknown location, probably in downtown San Francisco.